Production: Reggane Films (Algeria) and O.N.C.I.C. (France); EastmanColor (print by Technicolor), 35mm; running time: 123 minutes, American version: 127 minutes, Canadian version: 152 minutes, West German version: 145 minutes; length: 3472 meters. Released February 1969, Paris. Filmed in Algiers. Producers: Jacques Perrin and Hamed Rachedi with Eric Schlumberger and Philippe d'Argila; screenplay: Constantin Costa-Gavras and Jorge Semprun, from the novel by Vassilis Vassilikos; photography: Raoul Coutard; editor: François Bonnot; sound: Michèle Boehm; art director: Jacques d'Ovidio; music: Mikis Theodorakis. Cast: Yves Montand ( The Deputy Z ); Jean-Louis Trintignant ( The Magistrate ); Jacques Perrin ( The Journalist ); François Pértier ( The Public Prosecutor ); Irene Papas ( Hélène ); Georges Géret ( Nick ); Charles Denner ( Manuel ); Bernard Fresson ( Matt ); Jean Bouise ( Pirou ); Jean-Pierre Miquel ( Pierre ); Renato Salvatori ( Yago ); Marcel Bozzufi ( Vago ); Julien Guiomar ( Colonel ); Pierre Dux ( General ); Guy Mairess ( Dumas ); Magail Noël ( Nick's sister ); Clotilde Joano ( Shoula ); Maurice Baquet ( Bald man ); Jean Dasté ( Coste ); Gérard Darrieu ( Baron ); José Artur ( Newspaper editor ); Van Doude ( Hospital director ); Eva Simonet ( Niki ); Hassan Hassani ( General's chauffeur ); Gabriel Jabbour ( Bozzini ); Jean-François Gobbi ( Jimmy the boxer ); Andrée Tainsy ( Nick's other ); Steve Gadler ( English photographer ); Bob de Bragelonne ( Undersecretary of State ). Awards: Cannes Film Festival, Best Actor (Trintignant), 1969; Oscars for Best Foreign Film and Film Editing, 1969; New York Film Critics Awards, Best Motion Picture and Best Direction, 1969. Costa-Gavras, Constantin, and Jorge Semprun, Z; ou, L'Anatomie d'un assassinal politique , in Avant-Scène du Cinéma (Paris), October 1969. Michalczyk, John, Costa-Gavras: The Political Fiction Film , Philadelphia, 1984. Kostolefsky, Joseph, in Take One (Montreal), March-April 1969. Georgakas, Dan, and Gary Crowdus, "Costa-Gavras Talks," in Take One (Montreal), July-August 1969. Esnault, Philippe, "Cinéma et politique," in Avant-Scène du Cinéma (Paris), October 1969. Georgakas, Dan, and Gary Crowdus, "Costa-Gavras Talks about Z ," in Cineaste (New York), Winter 1969–70. Loewinger, Lawrence, in Film Quarterly (Berkeley), Winter 1969–70. Georgakas, Dan, in Film Society Review (New York), December 1969. Gow, Gordon, in Films and Filming (London), December 1969. Sarris, Andrew, in Village Voice (New York), 11 December 1969. Kael, Pauline, in New Yorker , 13 December 1969. Derain, Aline, in Films in Review (New York), January 1970. Costa-Gavras, Constantin, "Pointing Out the Problems," in Films and Filming (London), June 1970. Haskell, Molly, "Jean-Louis Trintignant," in Show (Los Angeles), 20 August 1970. "An Interview with Costa-Gavras and Jorge Semprun," in Film Society Review (New York), January 1971. Mellen, Joan, "Fascism in the Contemporary Cinema," in Film Quarterly (Berkeley), Summer 1971. Hennebelle, G., " Z Movies; or, What Hath Costa-Gavras Wrought," in Cineaste (New York), no. 2, 1974. Marty, A., "In contresens idéologique sur l'oeuvre de Costa-Gavras," in Image et Son (Paris), December 1977. Camy, G., "Costa-Gavras: Un certain cinéma politique," in Jeune Cinéma (Paris), November 1983. Johnston, Sheila, "Costa-Gavras," in Sight and Sound (London), Summer 1984. Poulle, F., "Le cinéma politique de grande audience, autopsie d'un prototype: Z ," in Cinemaction (Conde-sur-Noireau), no. 35, November 1985. Serceau, Daniel, "La trilogie," in Cinemaction (Conde-sur-Noireau), no. 35, November 1985. Dreifus, Claudia, "Constantin Costa-Gavras: Politics at the Box Office," in The Progressive , vol. 52, no. 9, September 1988. Castiel, E., in Séquences (Haute-Ville), no. 189/190, March/June 1997.
government expectations the magistrate refused to be manipulated and the intended cover-up became an embarrassing revelation: Lambrakis had been murdered by an extreme right-wing organization sanctioned by the authorities. Key witnesses began to disappear, and the deepening scandal eventually brought down the Karamanlis government. The Centre Left under George Papandreou came to office, but the king discharged his government, and on 21 April 1967 the military seized power. The examining magistrate was relieved of his responsibilities and strict censorship imposed. These chilling facts form the basis for Costa-Gavras's gripping political thriller Z . His narrative came not directly from the investigation, but from the novel by Vassilis Vassilikos, a Lambrakis follower, who had been given access to the evidence during the brief period of Centre Left rule. Published in 1966, the novel ends with the trial of the conspirators, but Costa-Gavras, benefiting from historical hindsight, extends his version to include the military coup. 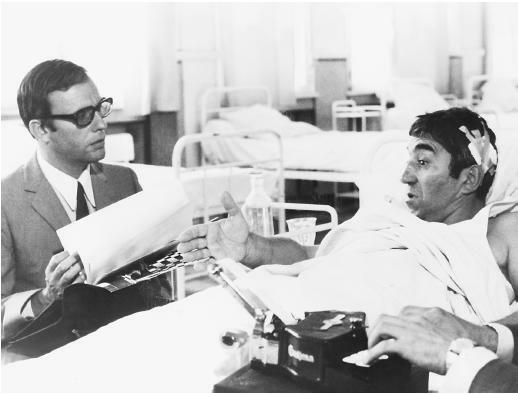 For his adaptation, Costa-Gavras sought the collaboration of Jorge Semprun who had previously worked with Resnais on La guerre est finie . The flashbacks providing background to the protagonists or exposing government manipulation, are characteristic of Semprun's organizing strategies. To produce a taut, fast-moving film narrative, the filmmaker discarded the novel's philosophical and reflective passages and reduced the range of characters, so that the journalist/photographer, for example, is a composite of several reporters. The dialogue has also been pared down, though some contemporary allusions to the May 1968 events in Paris have been added. Casting posed few problems since left-wing activists like Yves Montand were more than keen to participate. His engaging performance as Z is matched by that of Irene Papas as his tearful Hélène; JeanLouis Trintignant lends a steely authority to the magistrate's role. Financing the production, however, proved difficult: United Artists, for one, fearing retaliation, declined to back the project. Eventually the Algerian authorities, eager to add stature to their embryonic film industry, provided both finance and locations. Although the film contains no explicit topographical references, visual clues such as barely disguised portraits of the Greek royal family, the insignia of Olympian airways, and the Fix brand of beer indicate Greece as the setting, while the distinctive music of Mikis Theodorakis seals this identification. A challenging screen statement invites the viewer to associate the film's action with contemporary events: "Any similarity to actual events or persons living or dead is not coincidental. It is intentional." With the subtitle "Anatomy of a Political Assassination," the film exploits the investigative thriller format with more than a hint of melodrama. The characters, starkly differentiated, border on caricatures. The fascist elements have few physical or moral virtues: they are fat, ugly, or bald, and count pederasts amongst their numbers. Members of the humanitarian left, epitomized in Yves Montand, are attractive, warm-hearted, sensitive, and dignified to the point that Lawrence Loewinger termed them "cardboard saints." Political arguments are equally simplified and the foregrounding of dramatic situations leaves little room for objectivity. If derisive music accompanies the grotesque comic-opera officials as they parade before the magistrate, for the idolized Z the theme is resonant and emotionally charged, while tragic tones prepare the arrival of his widow Hélène. Camerawork, too, points up the message with telescopic close-ups for the long-awaited arrival of the deputy's plane, while blurred subjective shots after the clubbing reinforce the emotional participation. Similarly close-ups, alternating with all-embracing longshots, draw the viewer into the physical violence of the mob behaviour, and satirically emphatic zoom shots pick out the medal-bedecked chests of the corrupt generals. Such rhetorical devices effectively preclude a reflective approach: the persuasive presentation carries the viewer forward eager to unravel the web of deceit and obfuscation. Central to the film's narrative strategy is the editing process. Each witness will give a subjective account of events, set against a narrative flashback, to provide a further piece in the jigsaw. As false witnesses parrot their prepared statements, betraying themselves by the too-often repeated phrase "supple and ferocious like a tiger," there is a revealing disjuncture between speaker and image. Again, parallel editing juxtaposes the sentiments of the peace rally with the mob violence outside. Finally, repeated flashbacks of the murdered deputy create a sense of his immanence, thus providing a visual metaphor for the meaning of the Greek word "Z": "he still lives."